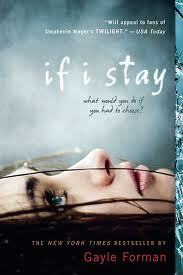 If I Stay was one powerful book! I experienced all kinds of emotions while reading this book. I laughed, I definitely cried, I smiled and I cringed. This book was painfully haunting and vivid. Each time I would have to put it down I would find the thought creeping in my head "What would I do? Would I stay?" Mia was an extraordinary character, I fell in love with her right away. The way this book is written you are pulled right into the book, you are a ghostly figure just like Mia watching everything unfold right along with her. The power of love plays a huge role in this book. Not just a love between a child and their family but a love between best friends, a love for music and a love between a boy and a girl. Adam and Mia's relationship is nothing like a "Typical high school romance" they are madly in love. They share the same passion for music and the same passion for each other. The love story from If I Stay was like an old-fashioned, classic tale. It was powerful, painful and beautiful. It has been a while since I was so moved by a book. So captivated. You can't help but ask yourself what you would do if you were in the same circumstance as Mia. At first the answer may seem obvious but as Mia starts seeing that it's a lot more complicated, you can't help but weigh out your own decision right along with her. If I Stay is bittersweet. I loved the entire story. It was unlike anything I have ever read and that was very refreshing. I cannot wait to get my hands on the sequel WHERE SHE WENT. This book is a must read! What made me love it: The unique storyline, the characters and the cover art. The cover is very haunting and it captures perfectly what lies inside the book. What I disliked: The length. I wish it was just a tad bit longer. All the while I was reading your review, I was nodding my head. I agree with everything you said and wished the book was longer too but it was a great book and I can't wait for the next book, Where She Went. Ooh, more Adam! I have this on my shelves. I need to get moving and read it. Thanks!